Special Features: Mid-sized grower with reliable white flowers. 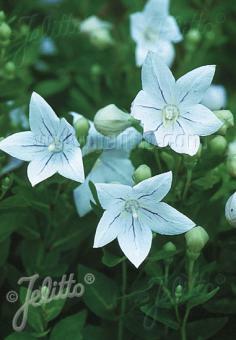 White balloon-like buds open to star-shaped blossoms with blue veins inside. The flowers can be used in arrangements. Upright growth emerging from a prominent taproot, steady. Historical: Introduced by JELITTO PERENNIAL SEEDS in 1991.